A fashion-forward option for seasonal parties, this short velvet holiday dress is overflowing with style and vibrant color. A shimmering metallic floral print beautifully contrasts against the black velvet background of the short party dress. With a chic one-shoulder bodice, this knee-length sheath dress features a fold-down collar that trims the asymmetrical neckline for a look that you're sure to love. 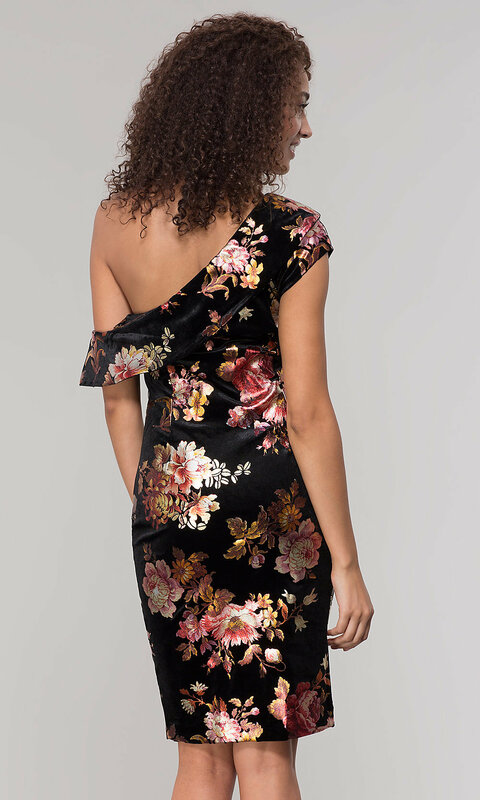 Attend a cocktail party, ring in the New Year, or draw an admiring glance at a semi-formal event in this floral-print short velvet holiday dress, under $100, that offers sophisticated style without emptying your bank account.